Whenever I travel outside Canada , I make sure to do logical shopping , meaning that whatever I bring back would not end up being confiscated by Customs Canada(That would be a waste of money!). We all want to get great shopping bargains but we also have to be careful on our shopping selections in light of airport security as well as to the Customs Division of our respective home country. Take for example the neverending commerce and travel between the U.S. and Canada. If you drive between both countries, you can practically bring a lot more stuff( wines,canned goods,perfumes,etc) in various sizes and quantities. If you were flying, weight and quantity restrictions would apply though. Liquids,creams and gels remain to be scrutinized though. If you were driving across either country, I’m sure bringing big bottles of Remi Martin cognac or Elizabeth Arden Green Tea Perfume (my personal favorite) for example wouldn’t be a problem. No worry pas, mon ami! Of course, whether you fly or drive, never transport fresh produce or meat, firearms, insecticides and other obvious items that are a real danger to homeland security to any country. Consider also your home country’s customs rules on duty-free amount limit. In Canada for example, effective June 1, 2012, (with regards to traveling to the U.S.) if staying for 24 hours in the U.S. ,you can declare up to CDN$200 tax-free; up to 48 hours, declare CDN$800 tax-free ; for a stay 7 days or more, no limit has been mentioned though the old rule used to say CDN$750.00. That’s my 2 cents’ worth on the matter. Even though I’m currently travelling here in the U.S., I still try to keep up-to-date with what’s happening back in Canada. Since I had been discussing in my recent blogs about some aspects of shopping, the ongoing news about the parking lot rooftop collapse at the shopping mall in Elliot Lake, Ontario hits a chord in many aspects. First, an everchanging list of missing/surviving folks believed to be inside the mall as well as moment-to-moment updates on the rescue operations. Considering that it’s taking quite some time to figure out how to have a safe and timely rescue of the people trapped within the rubble has really raised the frustration, anger and anxiety levels of the townsfolk. At the same time, they are drawing in their faith to help them ride through this very difficult moment. The shopping mall is located in Elliot Lake, a town with a relatively small population where everybody knows everybody. The nearest big city in Ontario province would be Sudbury. Both places are located in the upper north area of Ontario. The shopping mall is one of the town’s main employers(the other main industry being mining). One obvious point of this story is the fact that the shopping mall is inside a very old building with a prior history of building code violations. Whether it’s govt. bureaucracy or budgetary concerns compromising infrastructure safety, it unfortunately led to the injury and deaths of the victims (as of latest update these past 4 days —1 dead, 12 missing, at least 30 injured) and it needs to be addressed swiftly. This should never happen again. Things happen for a reason but sometimes, it can be very hard to see the logic behind it. It may take several days to look back and get the answer. Louis Vuitton Bag in a Flea Market? 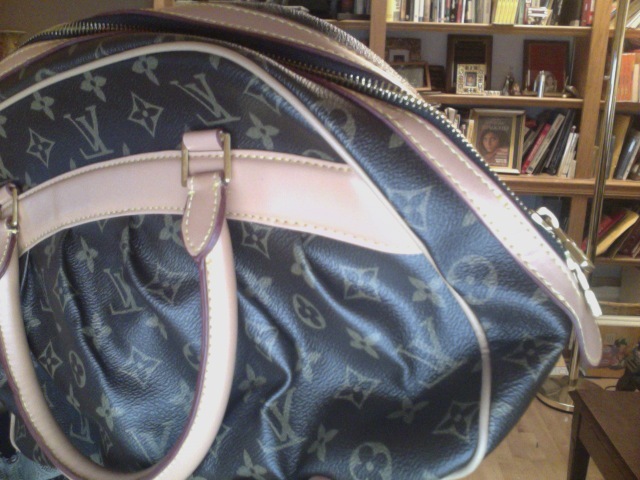 Who would’ve thought that I could find a knock-off Louis Vuitton bag at rock-bottom price while browsing a flea market? I kid you not. Cross my heart! One staple of American culture is the flea market. This is where people go to find the best bargains on items that others would like to get sell off. One’s castoff is another’s treasure. The flea market experience is virtually that of a treasure hunt, you’re always on the look-out for that unique item- that comes with a great price, of course. The Louis Vuitton bag that I got was hardly used and quite an impressive knock-off with all those intricate stitchings, colors, etc. The lady had been selling a lot of other brands like Gap, Abercrombie, and Ann Taylor (just to name a few) at great bargain prices too. I felt good about that bag purchase but I could tell that both my sister and her daughter (my niece) have set their eyes on that same bag. I might have to surrender it to them at some point. Oh well… there are still shopping days ahead. I still might find another bag that I could get for myself. Always keep your eyes open for anything interesting that may come your way while shopping. You never know, you may even get a good deal. What are the rules on carry-on/checked luggage these days? Am saying this because of my most recent experience when I arrived here in the US from Canada just 4 days ago. I have always considered myself to be a savvy traveler. I pack a lot of stuff efficiently on carry-on luggage because, unless it’s absolutely necessary, I don’t want to bring along checked luggage. Not only is it cumbersome to bring it along as well as to look after it, I’m still in disagreement over the ridiculous fees. Paying the airlines when I’m the one bringing in my own stuff?! Where’s the logic in that? I don’t buy the notion that the airlines are losing $$$ not with those outrageous fees that they’re all charging. It was 4 days ago- I still remember it as clear as day….. I had just arrived at the airport en route to the US. I went to queue at the US Immigration line for the usual inspection. The officer whom I encountered asked the usual query as to the purpose of my trip to the US, how long I’m staying, where I’m staying and what kind of baggage I am bringing along. As soon as I said that I was only bringing along a carry-on for a 2 and a half week stay in the US, I got a negative vibe out of him. He suddenly gave me both the left eyebrow lift and the the left lip smirk and appeared to be deep in thought as if he was undecided as to what to do next. He asked me again where I was going and how long I was going to stay there. I told him that I was going to stay at my sister’s place for 2 and a half weeks for a family reunion. I was starting to think that he was a bit deaf. He couldn’t believe that I could survive in the US for 2 and a half weeks with just carry on luggage. I was about to explain to him that I very well could when he cut me short and told me that my carry on needed to be checked by Customs. He then took my passport and customs declaration form and walked ahead of me, telling me to wait in the detention area. The immigration officer placed my documents in a bin next to the customs officer(he was reviewing the contents of another woman’s bag at the time). The immigration officer then said a few words with the customs officer then left without even looking back. I was starting to stew inside, but I told myself to stay cool and act accordingly. At least I was cleared by Immigration; the worse thing that could happen to me with Customs would be confiscation of my carry on. The customs officer called my name a few minutes later and asked what my story was. I said that I was there to have my carry on inspected. He replied, “What I meant was ‘what was the purpose of your trip’.” He gave me the typical spiel, and gave my usual answers. I suppose it was fair of him to ask as to how I can get by with just a carry on for 2 and a half weeks. I told him that since I was going to stay at my sister’s house that I usually borrow her washer/dryer so I have a set of fresh clothes to wear over and over. I also told him that I also can bring a lot of stuff with just my carry on because all it takes is just efficient packing. I explained that as unless necessary, I don’t bring checked luggage because I’d rather not pay checked luggage fees. The customs officer did nothing but nod to everything that I had just told him. He told me that he didn’t need to see my carry on but I told him that I already had it unlocked and he might as well see it. My intention was to let him know that I had nothing to hide and he can tell that immigration officer if he asks him during their coffee break. He then just said that this was only a random screening and I told him “It’s all right, I know that you’re only doing your job.” He said “Have a nice day.” and directed me to the terminal. As I was going to my next connection’s gate, I couldn’t help but wonder why they make such a fuss about bringing only a carry on for a few weeks when a lot of people nowadays do the same thing; I’m pretty sure that they don’t like those new luggage fees either. There are a lot of advice columns out there on how to pack one’s carry on efficiently to save on those checked luggage fees. I have my own travel tips as to how to pack efficiently as well, but that’s another topic another day. While in the next airport, waiting for my flight to my final destination, I heard an announcement over the monitor: “All carry on luggage will be randomly inspected as needed”. It gave me some comfort that it’s the norm now in terms of airport screening, but I wish I’d been given notice in advance– not be placed in the dark to keep second guessing as to what and why it happened. I know that some airlines are now starting to even charge carry on luggage as well and I hope it gets stopped at some point as it really doesn’t make sense to me. I also know that if you are in an airline’s frequent travelers’ elite club or sign up for that airline’s credit card to get more miles, you will also get the privilege of not paying any luggage fees at all. If joining such a club or getting their credit card free of charge is possible, then it’s worth it as well. However, I believe that being in the elite club would involve earning your spot there by flying a lot which I don’t think is still free. Perhaps if you look at it at another way, paying the fee to be part of such an elite club might be the fastest way to get your foot in and not do more extra traveling (on your money!) and earn your way there too. That’s my 2 cents’ worth on the matter. Well, my focus now is to just enjoy my US trip here before heading back to Canada; enjoy each day as it comes and make the most of it. That airport moment was one adventure in itself but a learning experience as well. It didn’t screw up the rest of my travel itinerary, thank God! Will keep you posted ,guys! Au revoir!